Nintendo worked around plenty of prototype ideas for the Wii U’s GamePad in the controller and the system’s early stages, and during the most recent session of Iwata Asks, the first two prototypes were revealed. 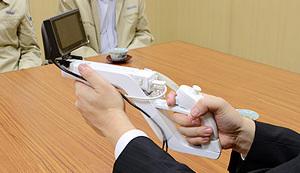 The first was pretty similar to a PS Move sharpshooter, with a Wii zapper taped with an LCD screen at its front (pictured below). The second one was more like the current Wii U controller, with two Wii motion sticks taped to the sides of a monitor (pictured above). 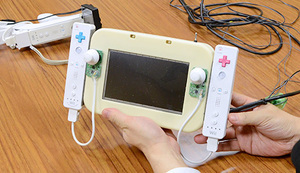 “We used this prototype and two Wii consoles to run simulations for Wii U,” said EAD boss Katsuya Eguchi. “EAD isn’t a hardware department, but a ‘handicraft team’ knowledgeable about hardware makes stuff like this. Looks pretty good, for a prototype. What do you guys think? Tell us in your comments.